Nothing hurts more than actually shelling out cash to prepare taxes. Except, that is, shelling out cash to pay taxes. If you do happen to opt for the prior, you’re in good company. Many of us choose to employ the assistance of a professional to help whittle down what we owe to Uncle Sam. Fortunately, though, there are many ways to cut down the costs of this process, too. Before plunking down money for any tax assistance, exploit all the free help that’s already out there, including free filing and free tax consultation. Many local libraries not only offer printed tax forms and publications for patron convenience, but also offer drop-in or by appointment tax help for completely free. As with everything in life, the more you’re willing to do and take on yourself, the more you can save, including when it comes to preparing and filing taxes. The plethora of tax software and sites out there is a great mix of DIY and the professional guidance that makes maximizing your refund and lowering your liability easier. If this route appeals to you, consider purchasing the software at your club warehouse store at a discounted price. If you’d rather take advantage of an online tax service, find out if accessing it via your financial institution’s site or another site can actually save you money. As a service and added perk to members, many companies and organizations offer links to such services at tax time that provide a discounted fee when accessed via their site specifically. The financial difference between accessing and logging in to a tax service site directly and through a third-party site can be substantial. If you have a simple tax situation, there are many ways to file your tax return for free. For more specific tax preparation savings opportunities, there’s a bunch of discount codes and virtual coupons out there just waiting for the taking (or rather clicking!). For example, on a website called savings.com, you can find coupon codes for tax preparation softwares, such as H&R Block At Home, TurboTax, as well as discount codes for in person tax filing services from Jackson Hewitt, etc. Don’t forget, too, that knowledge is not just power, but the power to save. Go directly to the source to find answers to your tax questions for free: the IRS. While waits on the telephone can be admittedly agonizingly long (I’ve drained my cordless phone many times…), much of the same information can be obtained easily and at your own convenience 24/7 at their site. Should you opt to pick up the phone anyway, you can reach the IRS directly at 1-800-829-1040 Monday through Friday from 7am to 10pm local time. Be sure to have your tax paperwork with you when you call and a paper and pen ready. As soon as you’re lucky enough to have a live person on the other end, they’ll spit out their tax ID number at you faster than you can actually process the information. Do make a note of this information and the day and time you called, though, and tuck it away with your tax paperwork. 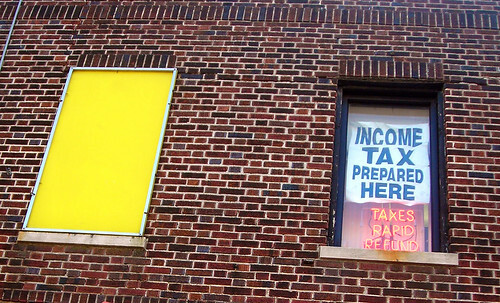 It never hurts to be able to substantiate your efforts to do your taxes correctly. Remember, no one has the right to evade taxes, but everyone has the right to lower their tax liability to the fullest extent of the law. BTW, there’s only one week until the 2011 tax deadline, April 18th. If you just start to prepare for your return, don’t forget to check out these last minute tax tips. A very grate post, i was needed that kind of informations. I hope that will help me in my businesses. I wanna open my IT firm and i need to know what to do to pay less for my taxes.Thanks for the post. Thanks for this information. I was not aware that the IRS actually assisted with tax prep. advice. Who knew? Very glad to offer the help. The IRS has actually been quite helpful every time I’ve called – even now that I’m in the process of being reviewed. I just can’t stress enough – always have a pen and paper ready BEFORE you call – they’re quite fast when a person actually gets on the line. Outstanding tax tips. I too never knew that the IRS actually had a arm to help people out. I was always under the impression that they were there to make people’s life difficult so never thought of approaching them for help. Thanks for the suggestion.